For scalable and area-efficient heterogeneous cache coherent systems. Ncore offers multiple configurable snoop filters, multiple configurable proxy caches and a modular, distributed architecture to provide system architects the most advanced technology and more degrees of freedom to innovate. 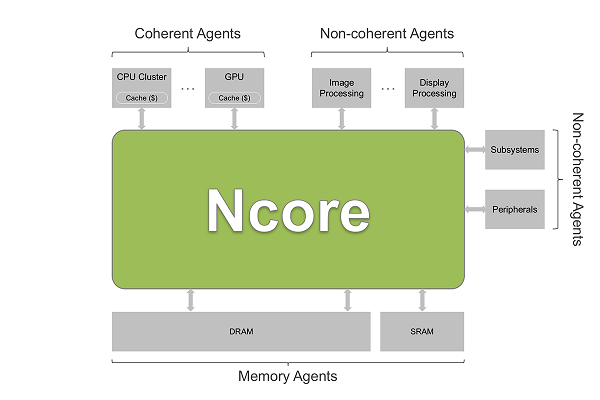 Ncore Cache Coherent Interconnect IP version 3 is a distributed heterogeneous cache coherent on-chip interconnect that enables SoC design teams to integrate processor clusters using the latest Arm ® AMBA ® CHI protocol (CHI Issue B). It is ideally suited for autonomous driving controllers and advanced driving assistance systems (ADAS), machine learning applications, server / data center processing, and networking applications.The Ncore 3 Cache Coherent Interconenct IP and Ncore Resilience Package are available for early access customers in November 2017.